Located in Little Cottonwood Canyon in Uinta-Wasatch-Cache National Forest, Snowbird is a winter and summer mountain resort known for its long ski season and steep terrain. Locals and visitors alike appreciate the laid-back atmosphere, variety of runs, and abundance of high-quality snow. 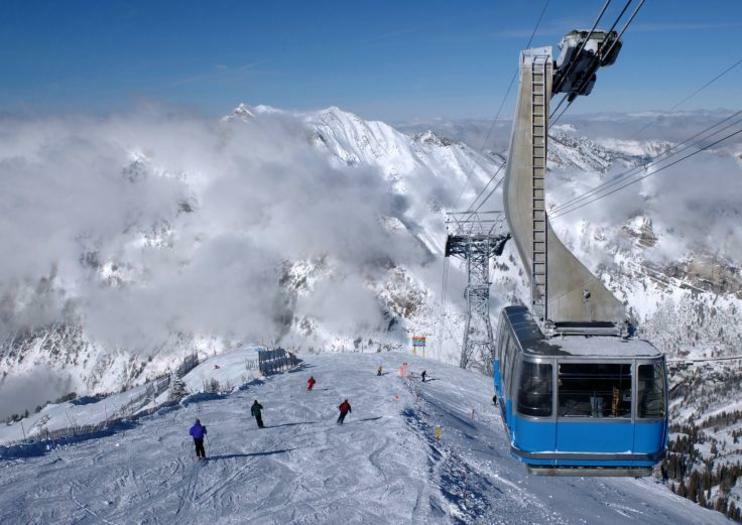 One of Utah’s bigger resorts, Snowbird features 2,500 skiable acres with six high-speed quad lifts, four double chairlifts, and one aerial tram offering access to 169 runs. Fine dining, casual dining, and plenty of drinks can be had, as there are 15 restaurants and five bars. Season passes, day tickets, and a combo ticket for both Snowbird and neighboring Alta Ski Area are available. Several shops at Snowbird Center and Cliff Lodge sell often forgotten items like hats, goggles, sunglasses, gloves, sunscreen, and lip balm. Child care is available for children who aren’t skiing. Equipment can be rented and repaired at the mountain. The terrain is 27 percent beginner, 38 percent intermediate, and 35 percent advanced. Head southeast of Salt Lake City to Utah State Route 210; the resort is about 30 miles (50 kilometers) from the city. Snowbird boasts one of Utah’s longest ski seasons, typically running from mid-November through May (snow permitting), with night skiing available during much of that time. Skip holidays and 3-day weekends if you want to avoid bigger crowds and longer lift lines. When the snow melts away and the temperatures rise, Snowbird becomes a high-altitude amusement park with a mountain coaster, alpine slide, ropes course, and climbing wall, plus hiking trails and fishing spots.